So you remember when I cooked a chicken a while back? We've been reaping the benefits of that baby for a while now. . . We had some excellent chicken sandwiches with sour dough bread from my favorite Logan Square bakery, La Boulangerie, something I can't remember, and fajitas! 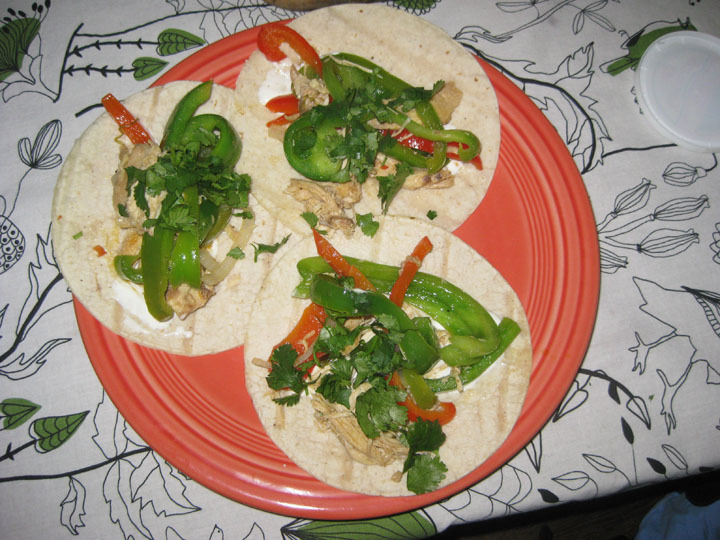 Fajitas are a staple around this apartment, like an about every two week kind of staple. Why? Because the are cheap, easy, and flipping delicious. When I have no idea what to make, I am tired, and I am really hungry I make fajitas. Let me tell you how. . . .
You can choose what ever kind of meat you want. . .chicken, steak, no meat, whateves. I go with chicken a lot and since I had the precooked chickie in my fridge, you better believe that is what I used. I used about a pound. Alright, so let's say you know you are going to make fajitas and have the meat 1 - 24 hours prior to dinner time, I suggest you marinade it for a bit. If you don't have time, don't sweat it, I don't. Just cover the meat in some olive oil, put a chopped jalapeno (for some kick) in there, add about a teaspoon of hot sauce, and a bunch of seasoning. I use this Fajita Seasoning from La Criolla, which seems to be a mix of salt, garlic, lemon pepper, and black pepper, so you could go that route too. Like I said earlier, you don't really need meat because the veggies in fajitas are where it is at. I like to go heavy on the veggies and light on the meat in most fajitas scenarios (unless I feel like I need some blood to feed my blood). Anyway, you need a couple peppers. In this case I used 2 green peps and 2 red. 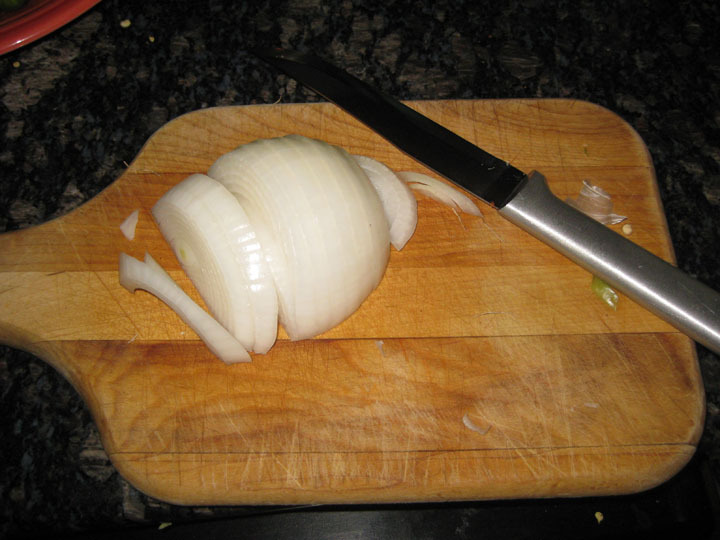 You will also need an onion. 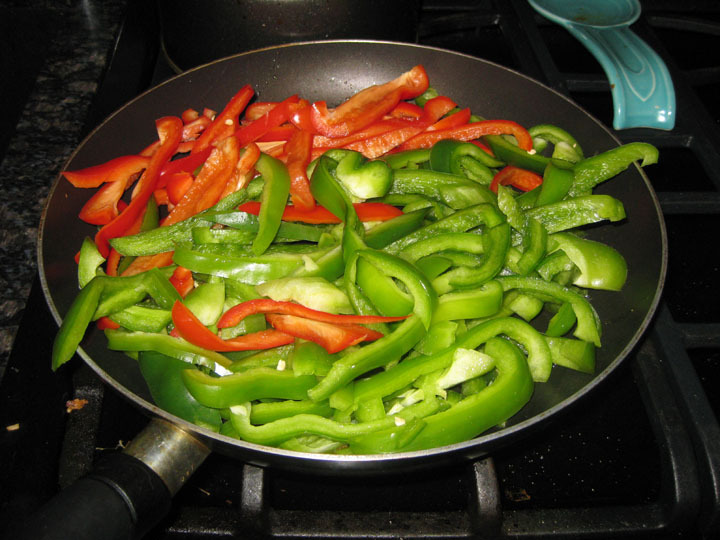 Dump your meat, marinade, and jalapenos in a steamy hot skillet and sear the outside of the meat. When the meat is seared turn the heat down. Add in your pretty peppers. Saute all these goods together until the peppers are al dente. 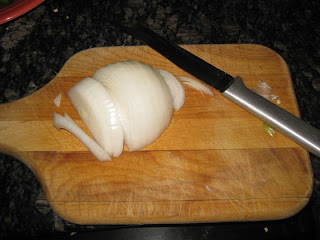 Then throw in the onions. Cook about 5 minutes more for some sweet fajitas. If you are living with someone like my boyfriend, Max, they will randomly sneak in to put more hot sauce into the mix. Typical. Wrap your fajitas in warm tortillas, I like corn and top with cilantro and sour cream. Damn I need to make these again soon. Let's just revisit that delectable photo. P.S. Jeffy, don't worry, I've got chicken in the freezer for pot pies. No me gusto picante.. soy lame-o. Love those fajitas! I love them too...especially with that cilantro. Love the moonstruck reference. I've seen a wolf in every man I know, and I see a wolf in you!